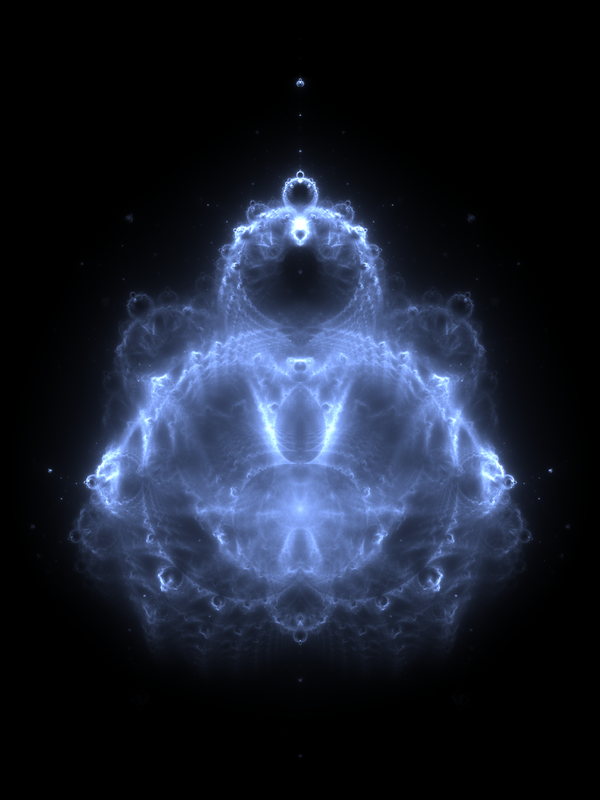 The Buddhabrot is a fractal rendering technique related to the Mandelbrot set. Its name reflects its pareidolic resemblance to classical depictions of Gautama Buddha, seated in a meditation pose with a forehead mark (tikka) and traditional topknot (ushnisha). Previous researchers had come very close to finding the precise Buddhabrot technique. In 1988, Linas Vepstas relayed similar images[ to Cliff Pickover for inclusion in Pickover’s then-forthcoming book Computers, Pattern, Chaos, and Beauty. This led directly to the discovery of Pickover stalks. However, these researchers did not filter out non-escaping trajectories required to produce the ghostly forms reminiscent of Hindu art. The inverse, “Anti-Buddhabrot” filter produces images similar to no filtering. Green first named this pattern Ganesh, since an Indian co-worker “instantly recognized it as the god ‘Ganesha‘ which is the one with the head of an elephant.”[ The name Buddhabrot was coined later by Lori Gardi. Here is a video by YouTube user Mathologer describing, in a somewhat cheezy fashion, some of the interesting mathematics involved in depicting both the Mandelbrot halo used to generate the Buddhabrot and the complexity within the Mandelbrot Set itself. Some of what YouTube user Mathologer presented in the video above is the beginnings of describing the close relationship between the Mandelbrot Set and the Logistic Map. reproduction where the population will increase at a rate proportional pto the current population when the population size is small. starvation (density-dependent mortality) where the growth rate will decrease at a rate proportional to the value obtained by taking the theoretical “carrying capacity” of the environment less the current population. Here we see an animation depicting the Buddhabrot and its logistic map. With r between 0 and 1, the population will eventually die, independent of the initial population. With r between 1 and 2, the population will quickly approach the value r − 1/r, independent of the initial population. With r between 2 and 3, the population will also eventually approach the same value r − 1/r, but first will fluctuate around that value for some time. The rate of convergence is linear, except for r = 3, when it is dramatically slow, less than linear (see Bifurcation memory). With r between 3 and 1 + √6 ≈ 3.44949, from almost all initial conditions the population will approach permanent oscillations between two values. These two values are dependent on r.
With r between 3.44949 and 3.54409 (approximately), from almost all initial conditions the population will approach permanent oscillations among four values. The latter number is a root of a 12th degree polynomial (sequence A086181 in the OEIS). With r increasing beyond 3.54409, from almost all initial conditions the population will approach oscillations among 8 values, then 16, 32, etc. The lengths of the parameter intervals that yield oscillations of a given length decrease rapidly; the ratio between the lengths of two successive bifurcation intervals approaches the Feigenbaum constant δ ≈ 4.66920. This behavior is an example of a period-doubling cascade. At r ≈ 3.56995 (sequence A098587 in the OEIS) is the onset of chaos, at the end of the period-doubling cascade. From almost all initial conditions, we no longer see oscillations of finite period. Slight variations in the initial population yield dramatically different results over time, a prime characteristic of chaos. Most values of r beyond 3.56995 exhibit chaotic behaviour, but there are still certain isolated ranges of r that show non-chaotic behavior; these are sometimes called islands of stability. For instance, beginning at 1 + √8[ (approximately 3.82843) there is a range of parameters r that show oscillation among three values, and for slightly higher values of r oscillation among 6 values, then 12 etc. The development of the chaotic behavior of the logistic sequence as the parameter r varies from approximately 3.56995 to approximately 3.82843 is sometimes called the Pomeau–Manneville scenario, characterized by a periodic (laminar) phase interrupted by bursts of aperiodic behavior. Such a scenario has an application in semiconductor devices. There are other ranges that yield oscillation among 5 values etc. ; all oscillation periods occur for some values of r. A period-doubling window with parameter c is a range of r-values consisting of a succession of subranges. The kth subrange contains the values of r for which there is a stable cycle (a cycle that attracts a set of initial points of unit measure) of period 2kc. This sequence of sub-ranges is called a cascade of harmonics. In a sub-range with a stable cycle of period 2k*c, there are unstable cycles of period 2kc for all k < k*. The r value at the end of the infinite sequence of sub-ranges is called the point of accumulation of the cascade of harmonics. As r rises there is a succession of new windows with different c values. The first one is for c = 1; all subsequent windows involving odd c occur in decreasing order of c starting with arbitrarily large c.
Beyond r = 4, almost all initial values eventually leave the interval [0,1] and diverge.